To promote the history and culture of the Métis people and otherwise to promote the cultural pride of its membership. To promote the education of its membership respecting their legal, political, social and other rights. To promote the participation of its members in community, municipal, provincial, federal, Aboriginal, and other organizations. To promote programs to its members including housing, youth programming, educational services and human resources initiatives. Generally, to promote the political, social and economic interests of its members. 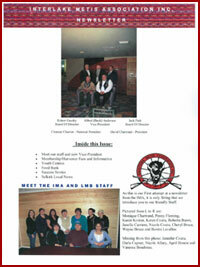 We invite all of our Locals to submit information and dates of their Local meetings to info@intma.ca to be posted on this our site.To find out more information on Interlake Metis Association Locals and their respective boards follow the link below.